I recently acquired this Kevin the Bold comic from 1968 by Kreigh Collins. Beyond liking the drawing, I bought the comics because of the astonishing last two frames. "Kreigh Collins (1908-1974) began his career as an illustrator for magazines in the 1930s. 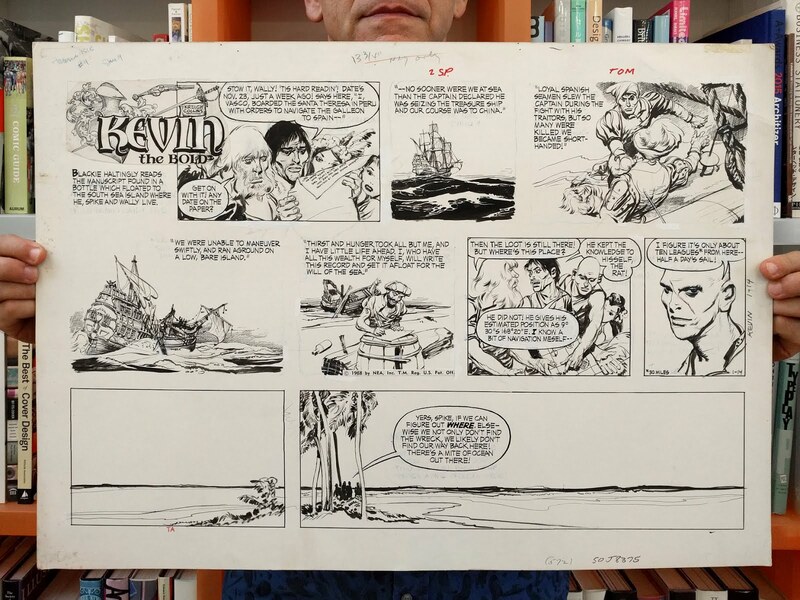 In 1950, along with writer R. R. Winterbotham, Collins debuted his most popular work, the newspaper strip Kevin the Bold. Kevin the Bold (1950-1968) was a comic strip whose star originally appeared as a supporting character in a strip called Mitzi McCoy, first published in 1948. The original strip focused on the escapades of a 20th-century socialite and heiress. When she met her 15th-century ancestor, Kevin, he became the new star and the strip was renamed for him. Kevin, originally presented as an Irish shepard, eventually becomes something of an errand boy for King Henry VIII." Much more of Kreigh Collins' work can be seen here and here.